"Super Robots, Magical Girls and Ninjas. What could go wrong?" A mob assassin is hired to retrieve an object from a local scientist and ends up kicked out of the family, put on a retainer from a mysterious corporation and with a robot for a partner. The business? Whatever comes up; but with two witches competing for control, 'whatever' is usually magical and dangerous. Skyway Mechanix has not been tagged yet. Help others find Skyway Mechanix by tagging it! 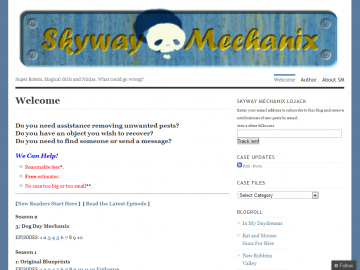 Skyway Mechanix has not been reviewed yet. Skyway Mechanix has not been recommended yet.